In this blog, we round up the Manufacturers round table dinner event that we attended recently, hosted by Columbus and The Manufacturer. (My colleagues Steve Wilson and Andy Croghan were at the other dinner that evening and their write up on the discussions at their table can be found HERE). The evening kicked off with fairly indepth discussions on GDPR (thanks to Jessica Hall for her insights, it was obviously her specialist subject!). Our host Henry Anson, MD of The Manufacturer, was keen to drive this issue front and centre as he is concerned that most manufacturers he is speaking with really do not understand GDPR in terms of the risk and the impact on their business and what they need to do about it. To illustrate the point, one of the guests at the dinner who is CEO of a very successful manufacturing business in the Midlands had never heard of it. (He’s probably doesn’t go on to LinkedIn very often then ;-). I think it’s true across most sectors that most people are unsure what it really means for them and what they need to do about it. But Henry’s concern is that manufacturers seem to think it’s not really relevant for them so they don’t need to worry about it at all. 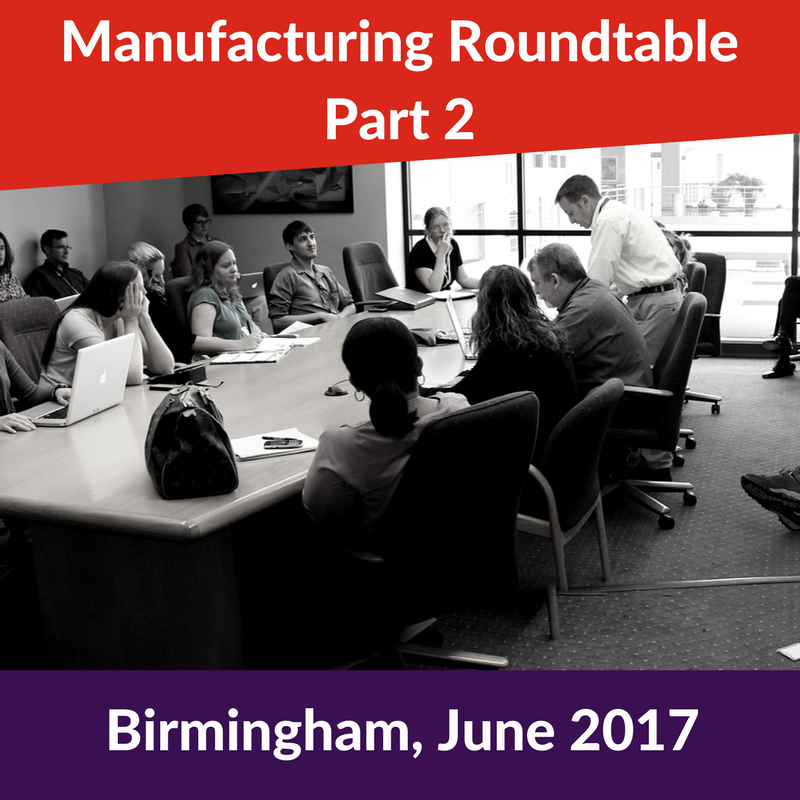 But the fact is that D-Day is looming in that it comes into effect in May 2018 – so he’s keen that there’s a concerted effort to to help educate and inform the manufacturing sector. We talked about whether it really was as ‘big and scary’ as some people are making out, or is it going to be another Y2K where there was a lot of fear and hype and build up and then nothing really happened (other than a lot of companies spending a lot of money on projects that probably weren’t really required). We then moved on to the topic of Servitisation and we had a bit of a heated debate on what this really meant and it’s importance or otherwise. Henry is very for it and given he’s not the shy and retiring type, made a very energetic plea for UK manufacturing to get with the programme and grasp the new opportunities it presents. I can’t say I’m an expert on the subject – but given that the gist of it is about boosting growth through adapting manufacturing business models to offer supplementary services and solutions on top of the core products, then it sounds like a sensible thing to be looking at going forward for additional revenue streams. There are some good case studies of this in action with the likes of Rolls Royce’s shift to ‘Power by the Hour’ – instead of charging customers for the repair and maintenance they now charge for the actual performance and output of their engines. However, for the vast majority of UK manufacturers I would doubt that they have the systems or processes in place to accommodate this transformation yet, or indeed the people and skills required. But certainly something the progressive and innovative companies should be considering in their future growth plans or they may well get left behind. Next up was the topic of ERP for SMEs. One of the manufacturers in the room had built up his manufacturing business to a fairly significant size but still hadn’t invested in ERP. Whenever they’ve looked at it before he just couldn’t be convinced it was the right thing for his business, and all the case studies and examples he’d heard seemed to only be focused on the large corporates rather than SMEs. However, with a growth strategy to double turnover in the next 3 years, he was at the dinner to learn more about ERP and ‘be proved wrong’. This was a topic that I was obviously glad to be able to provide some of my own expertise and insights around how the ERP market has changed from the early days – where it really was mostly large scale ERP systems suitable for mostly large scale business with the likes of SAP and Oracle leading the way. These days there are many more ERP systems and solutions on offer to suit all sizes and types of manufacturing businesses. Many of these have been built specifically with the smaller sized companies in mind, and some specifically for manufacturers. So generally, they will come with a smaller price tag and a quicker implementation approach. Interesting to note though, that despite the maturity of ERP and despite the best efforts of the plethora of ERP vendors marketing departments, there are still businesses out there that don’t think there’s an ERP system that suits their business. There were a couple of key points from this discussion though. Firstly, clear evidence that for this business owner just like many others, the focus needs to be on the business growth plans and what needs to be in place across people, process and systems to create that platform for growth. ERP is just an enabler. And the second point is that the focus needs to be on what business benefits and business value the ERP system can help drive. It really can’t be a technology led discussion or project, it needs to be business led. We also touched on the food and drink manufacturing sector and how the margins being worked to are extremely low and so it’s a very tough market. However, I was able to add into the discussion that our experience in the Scottish food and drink sector has shown that it’s booming at the moment: and that there is an interesting pattern of success for businesses who focus on premium products that can trade on their heritage and provenance and so they’re able to increase their margins. We’ve been doing a lot of work with food companies implementing growth strategies and associated digital transformations recently. I was grateful for the opportunity to take part in the evening – always really interesting to hear first hand the different experiences and perspectives on topics that are affecting the manufacturing industry.